By postponing the second leg of the Copa Libertadores final, CONMEBOL finally showed leadership and decisiveness. But given the way it handled Saturday's tragic events, the confederation still has many questions to answer. BUENOS AIRES, Argentina – At least on Sunday there was leadership and decisiveness. At 2 p.m. local time came the announcement that everybody had half-expected: the second leg of the Copa Libertadores final between River Plate and Boca Juniors, having been postponed from Saturday, was going to be postponed again. CONMEBOL, the South American football confederation, will meet in Asunción, Paraguay, on Tuesday to discuss when and where the second leg will be played. 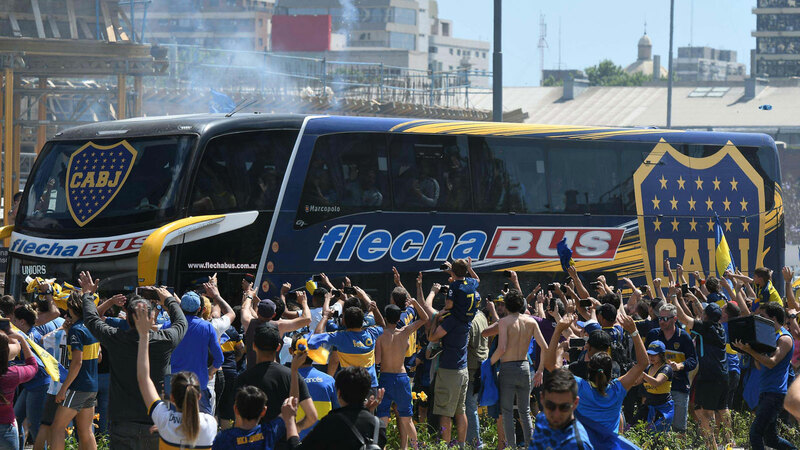 There must also be questions about whether River will be sanctioned for the incidents on Saturday when the Boca team bus was attacked. Windows were broken, allowing tear gas into the vehicle, incapacitating several players. CONMEBOL president Alejandro Domínguez spoke with controlled fury and was in no mood to play down the seriousness of the situation. "The mentality at the moment is that this is a disgrace,” he said, “that we’re talking about a situation like this, because of a few misfits, for what is a game of football. The decision, he said, had been taken in the interests of fair play, given that Boca’s players were still suffering the after-effects of the attack. The most serious injury was suffered by the midfielder Pablo Pérez, who went to hospital with an eye injury on Saturday. Although he had returned to the stadium and was included in the starting line-up to play at the (first) rearranged kickoff time of 7:45 p.m. local time, his ophthamologist had warned him not to play on Sunday. “Now,” Domínguez said, “we have to analyze this from the perspective of what is sporting and fair. There is a team who have been injured, and we are here for the good of the spectacle, so that when the starting of XI of both clubs enter the field, they go without any excuse, that match is played on a level playing field, equal conditions...CONMEBOL have decided to that in these circumstances, there is not sporting equality...it’s not just his [Pérez’s] medical condition. There were four or five other players. I think in these conditions, this is all logical." Impressive as his tone was, CONMEBOL still have serious questions to answer. What happened on Saturday when, if Carlos Tevez and Fernando Gago are to be believed, pressure was put on Boca to play. And what was the sequence of events on Sunday, as River allowed fans into the stadium and confirmed the game was to be played, 20 minutes before it was called off? Sunday was less chaotic than Saturday, but that is not saying much. These are fine words, but achieving that vision in a country in which 93 people have died in football-related violence in the last 10 years is very difficult. "This is not the Argentina we love, we know, it’s not the majority,” Domínguez said. “This is not Argentinian society, these are misfits. We have to use this time to give a good sign to the world we can do things well." But the problem is that it is Argentinian society. The violence of Saturday was actually relatively lowkey by local standards. 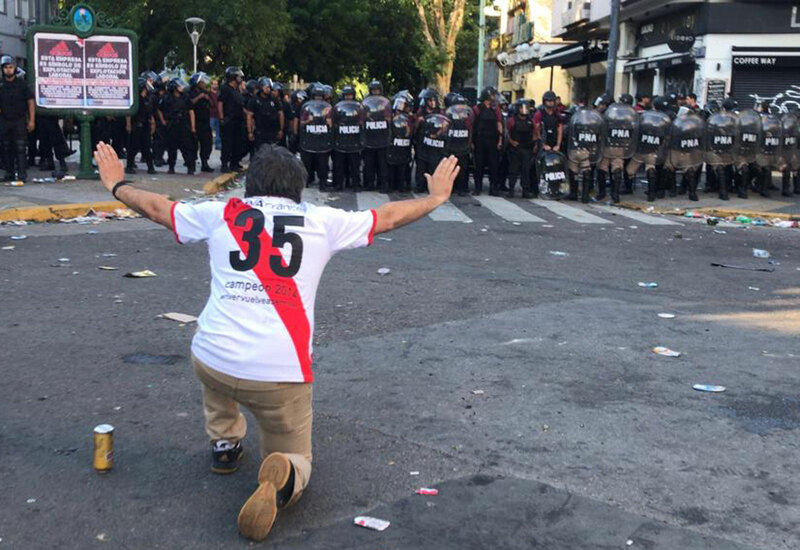 There is an issue with a section of society that, with little hope, pins its identity to football clubs with worrying fervor – and that is probably beyond the capacity of CONMEBOL to resolve. Then there are all manner of questions to do with the erosion of faith in the rule of law, all of which seem far beyond the scope of football to address. The immediate concern, though, is to work out if and when this game can be played. After all, CONMEBOL is supposed to be sending its champion to the Club World Cup, which begins in the United Arab Emirates on Dec. 12 (though CONMEBOL's entrant won't play its first match until Dec. 18). In the end, though, it may turn out that River vs. Boca in the final of the Libertadores was simply too big a game ever to be played.